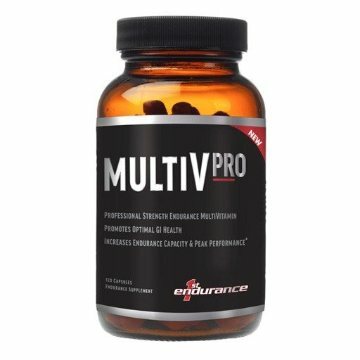 MultiV-Pro is a comprehensive multivitamin that’s designed to meet the unique requirements of professional endurance athletes, delivering the power of 4 products in one bottle. (1) Provides clinically effective doses of vitamins, minerals and key endurance specific nutrients designed to enhance overall wellness. (2) Features our exclusive Beta Glucan complex with Wellmune®, which has been clinically proven to reduce upper respiratory tract infection symptoms associated with hard training, improve recovery times, and offer unparalleled immune support. 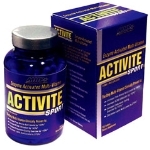 (3) Utilizes a proprietary prebiotic/enzyme blend to enhance macro and micronutrient absorption. (4) Includes a clinically effective dose of iron amino acid chelate to maximize aerobic capacity and ensure peak performance. For additional information go to firstendurance.com. Distance runners, competitive cyclists, elite triathletes or any other kind of endurance athletes require a vast amount of caloric intake to maintain optimal hydration and energy levels. �This alone puts a lot of stress in the gastrointestinal (GI) tract. �On top of that, quite frequently during training or racing, endurance athletes may experience GI problems. �Research shows that up to 70% of athletes experience some GI difficulties at some point of their training or racing [1-3] . GI complaints may vary from bloating and flatulence to episodic stomach aches, stomach cramps, acid reflux, constipation or diarrhea, just to mention some. Don't panic. �Excluding any pathological issues behind these GI problems, there are nutritional steps that you can take regularly to enhance the GI function and, in the long term, avoid potential distress caused either by a caloric overload or other reasons. Good GI activity is fundamental for effective nutrition because most of the essential nutrients are absorbed and digested in the gut. �Healthy gut means better nutrient absorption, improved utilization of energy from the food and less stress throughout the digestion process.� This may additionally lead to fewer GI complaints during training and racing. However, advancing the GI health is a process that does not happen overnight. �GI activity is enhanced by an increase in the number of the microorganisms that live normally in the gut (mainly some kind of bacteria). When these bacteria grow in number, they create colonies. �Colonies are formed only by long-term and consistent food and supplement intake. Among the most widely used food supplements to improve digestion health are probiotics and prebiotics. Over the years, research has shown that probiotics, (mainly some type of bacteria and yeast) are digestible microorganisms that can alleviate symptoms of lactose intolerance and treat or prevent diarrhea [4, 5] . �The prebiotics on the other hand, are non-digestible oligosaccharides that can stimulate and regulate the growth of probiotic microorganisms and, over time, improve nutrient absorption and health [4, 5] . During the past decade, research has started considering the health benefits from a combined formula of probiotics and prebiotics. �In an extensive review of clinical trials in humans published by the British Journal of Nutrition in 2002, the authors mention the therapeutic and prophylactic benefits of probiotics, as well as their ability to enhance the immune system by activating a variety of immune system related genes. �Also, the authors mention the immunological effects that prebiotics have by activating or enhancing the activity of the probiotic microorganisms . �So, the prebiotics increase the numbers of the probiotic microorganisms (the bifidobacteria in particular) that exist in the gut. Additionally, prebiotics have been linked to an enhancement of mineral absorption in the large bowel . Interestingly, more research results demonstrate that patients with chronic GI diseases or individuals with compromised or distressed GI tract receive the greatest benefit from prebiotic supplementation (review: ). In conclusion, a combination of probiotics and prebiotics may work synergistically.� The former has been proven over the years to enhance the number of the healthy microorganisms in the gut, and the latter to enhance the activity of the former. Optimal nutrition and GI activity can achieve greatness through optimal nutrient absorption in the gut. Optimal nutrient absorption in the gut requires a healthy gut. And a healthy gut can be achieved by regular intake of probiotics and prebiotics that provide a beneficial, synergistic effect. So that you can go out and train and race as hard as you can. Also, because of the recent research showing the detrimental affect of too much vitamin C & E, it's also the first Multivitamin that is doesn't have vitamins C & E, yet still offers a blend of polyphenols for oxidative support. A:� Endurance athletes put a lot of stress on their body so they have significantly different needs and requirements than the general population. Because of this, higher levels of micro-nutrients are required in order to avoid overtraining and other ailments.� If these unique requirements are not met, the immune system, digestive system and cardiovascular system all become compromised.��� The new MultiVHP protytype delivers clinically effective doeses of of essential nutrients like Iron amino acid chelate, 1,3-1,6 Beta-Glucan, Gingko Biloba, a polyphenol blend and pre and probiotics which are not found in any other multivitamin. A: It's important to note that not all Beta Glucans are created equal.� First Endurance uses the ONLY yeast-derived (saccharomyces cerevisiae) 1,3-1,6 Beta Glucan becaue it's been clinically proven, on endurance athletes, to decrease upper respiratory tract infections and reduce the risk of illness and infection associated with hard training.�� The specific Beta Glucans used in the new MultiVHP prototype allow you to stay healthy and strong more often than ever before. A: Endurance athletes require more calories than average people in order to fuel their training.� This, coupled with the stress of everyday life, can compromise your digestive system and negatively effect the absorption of all micro and macro nutrients.� Prebiotics are non-digestible oligosaccharides that can stimulate and regulate the growth of probiotic microorganisms and, over time, improve nutrient absorption and health.� Probiotics are digestible microorganisms that can alleviate symptoms of lactose intolerance and treat or prevent diarrhea. A:� Recent clinical studies have shown Vitamin C and Vitamin E may be detrimental to endurance capacity and training because they down-regulation the bodies own natural inflammatory response. A:� The new MultiVHP prototype contains 150% of the RDA daily value of Iron because research shows 30-50% of endurance athletes have depleted iron levels. When iron levels are low, less oxygen is delivered to the muscles and aerobic capacity declines. To ensure peak performance, the new MultiVHP prototype is formulated with a highly bioavailable Iron Amino Acid Chelate that's also gentle on the stomach. �Consuming more than 100% of the RDA of Iron is not recommended for the general public.� For hard-training endurance athletes, however, Iron and blood ferritin is often compromised and can therefore limit oxygen carrying capacity and endurance performance.�� Consuming 150% of a highly bioavailable Iron amino acid chelate is not only safe for endurance athletes, it's recommended and highly beneficial.